Architecting for Security on AWS | Free eBooks Download - EBOOKEE! This course will help you learn to apply security at all layers of AWS, including encrypting and protecting data at-rest and in-transit, as well as how to prepare for and respond to security events. AWS security architects need to understand how to build security into every AWS deployment at every level. 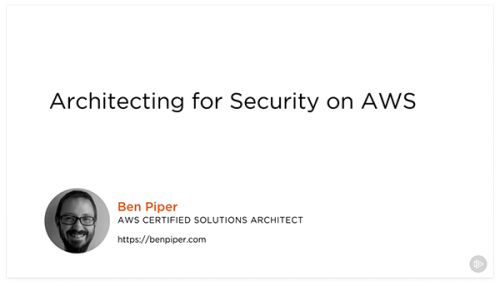 In this course, Architecting for Security on AWS, you'll learn how to secure your data and your AWS services and resources at multiple levels using a defense-in-depth approach. First, you'll learn how to protect your AWS credentials using identity and access management. Next, you'll see how to capture and analyze logs using CloudTrail, CloudWatch, and Athena. Finally, you'll learn how to implement network and instance security, encrypt data at rest and in-transit, and set up data backup, replication, and recovery. After finishing this course, you'll be ready to granularly control access to your AWS resources. No comments for "Architecting for Security on AWS".